Justin Huertas throws one crazy coming out party with his raw, exciting premiere of Lizard Boy. He wrote the book, composed the tunes and portrays the title character. 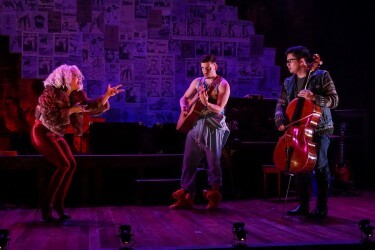 Sitting in on its spirited opening night, I thought of Bob Dylan’s line, “Something is happening and you don’t know what it is…” The 90-minute one-act is a cockeyed blend of social commentary, high-tech romance, comic book super-hero clashes and a rock and roll show case. Some of it works well, some of it doesn’t, but it is all entertaining and remarkably original.